Shane Lowry drives on the 18th at El Saler. 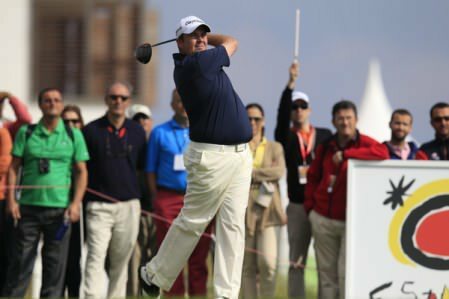 Eoin Clarke www.golffile.ie.Shane Lowry might be inconsistent but he’s certainly not boring as he showed with a superb 66 in the second round of the Spanish Open at El Saler - the joint best round of the day. The Offaly man had taken 35 putts in an opening 78 that left him 139th and in danger of missing the halfway cut. But he turned his week around in spectacular style on Friday, carding seven birdies and just one bogey to join Waterville’s David Higgins (75) in a share of 30th on level par. On a day when former US Amateur champion Peter Uihlein made a late charge to the top of the leaderboard, carding a four under par 68 that moved him one shot clear of the chasing pack on six under, Lowry had just 27 putts to scorch onto the fringes of contention. “Just the 12 shots better today. Hopefully will be an exciting weekend here in Valencia,” Lowry tweeted. Peter Lawrie putts on the 15th in the second round of the Spanish Open. Picture: Eoin Clarke www.golffile.ieStarting on the back nine, the Clara man birdied the 10th, 11th, 13th and 15th to turn in 32 and followed his lone bogey of the day at the par-five third with late birdies at the fifth, seventh and eighth. Higgins failed to make a birdie on day two, hitting just six fairways and taking 33 putts as he followed a double bogey seven at the fifth with a bogey six at the 15th to join Lowry on level par. Gareth Maybin (71) and Peter Lawrie (74) made the cut with a stroke to spare on one-over par but Damien McGrane (75-72) came up one shot short for his sixth missed cut from 10 starts since the season began in December. It was also a disappointing week in Valencia for Michael Hoey who had two poor days on the greens and added a 76 to his opening 75 to miss the cut by five. Mourne amateur Reeve Whitson, playing as a reward for his Spanish Amateur Open win, followed his 81 with a 77 but gained invaluable experience should be decide to go to the European Tour Qualifying School later this year. As for Uihlein, the in-form American rallied towards the end of his round with birdies at the 14th, 15th and 17th, after reaching the turn in two under before dropping a shot on the 10th, and enters the weekend on seven under par. The Massachusetts native – whose father Walter is the CEO of major golf equipment company Acushnet – has been in stunning form thus far in 2013. The 23 year old finished in the top five in his last European Tour appearance at the Tshwane Open in March, followed seven days later by a top ten at the Puerto Rico Open on the US PGA Tour. He is now in pole position for a first win in Europe at Parador de El Saler, having played a full season on the Challenge Tour, as well as six events on The European Tour, in 2012. “Leading a tournament is fun,” he said. “I have been close a couple of times after two rounds, so it’s nice to have the lead and be able to see how I do. It’s all part of the learning process, and the more I do it the more comfortable I’ll feel. One shot back from Uihlein were Chile’s Filipe Aguilar, Frenchman Rafaël Jacquelin and Sweden’s Rikard Karlberg, who could have entered the weekend’s play a shot clear but for back to back bogeys in his final two holes. The 26 year old got off to a stunning start, with a birdie at the first followed by an eagle two at the par four second before dropping two more shots to clear the opening four holes in five under par. In favourable afternoon conditions, Karlberg built on that start by gaining shots at the par five 11th and the par four 14th before two dropped shots left him in tied second place. Local favourite Gonzalo Fernández-Castaño, meanwhile, could not build on his strong start on home soil as the 32 year old carded a one over par second round 73, leaving him in tied 14th on two under par alongside compatriot and former Challenge Tour Number One Alvaro Velasco, amongst others. 161 G Boyd (Eng) 83 78, A Kaleka (Fra) 79 82, J Simon De Miguel (am) (Esp) 77 84. It's still far to early to panic but Shane Lowry might just be getting a little bit anxious about his tour card after missing his third cut on the spin and his sixth from his last seven starts in the Volvo China Open. David Higgins loves El Saler. Picture: Eoin Clarke www.golffile.ieWhen David Hggins won back his tour card last November he had no doubts he could still win on tour. “Put me on the right course in the right conditions and I feel I can win,” he said. David Higgins chips to the seventh at El Saler. Picture: Eoin Clarke www.golffile.ieDavid Higgins might be joint top for scrambling and sand saves but he’s eight shots behind Scot Marc Warren with a round to go in the Spanish Open. Ernie Els is in the driving seat the BMW International Open. Picture courtesy Getty ImagesA mid-round double bogey did little to upset the Rolls Royce that is Ernie Els as he purred his way into a one-stroke lead at the BMW International Open. Shane Lowry drives on the 18th in Munich on Sunday. Picture: Eoin Clarke www.golffile.ieShane Lowry gave his confidence a boost ahead of the Irish Open when he closed with a seven under 65 in the BMW International Open in Munich.